A man has appeared in court charged with murder after a man died in a Midlothian street. 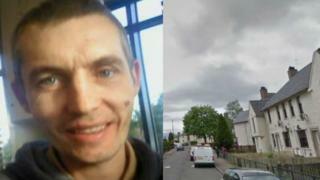 John Lynch, from Rosewell, died at the scene in Dalkeith on Saturday after being found with serious injuries. A statement on behalf of his family said Mr Lynch, 41, was "much loved...and will be dearly missed". Paul Alexander, 45, was charged with murder when he appeared at Edinburgh Sheriff Court. He made no plea and was remanded in custody.